Write a critical appreciation of: (p27 - Charlie - "Everything all right?" , p36 - Willy - "What a man! There was a man worth talking to. I was right!" ) To what extent does this passage reflect the tone, style and concerns of the play as a whole? Include : * Respond with understanding to the texts genre and period (A02) * Analyse and evaluate Millers choices of form, structure and language to express meaning (A03) Miller makes clever use of a mixture of realism and expressionism to depict the workings of Willy's mind, his imagination and memories, as he struggles to make ends meet in the business world which has become strangely more hostile than Willy remembers. Here we can see Miller's belief in the ever present past where Miller asserts the conviction that the past remains with a person, influencing their decisions throughout their life. This is very true for Willy as he is always worrying about decisions he made in the past; that life may have been better if only he could change what he's already done. We see this most clearly in his memories of Ben, and his expedition into the jungle which left him rich. Willy keeps going over this in his mind, as he regrets his past decisions and convinces himself that going with Ben would have made him a success too However, the audience can see through Ben, who left Willy and his mother when Willy was only three years old. ...read more. Because Willy feels that he isn't doing as well as Charley he uses any opportunity he can to make out that he is better than Charley in any respect. Willy : Well, you don't know how to eat...You gotta know about vitamins and things like that. It is clear to the audience that Willy doesn't have a clue what he is talking about and is just trying to look smarter than Charley. Because of this we can see the irony of Willy's words, "Don't talk about something you don't know anything about." This situation also shows us of Willy's volatility, as he becomes angry at every small thing. When Charley seemingly challenges Willy about his knowledge of "vitamins", Willy erupts. The audience can see that Charley is only joking but because Willy feels inferior, he takes everything Charley says to heart and responds precariously, but Charley, being a good friend, tries to keep the situation calm on several occasions, Charley - Don't get insulted...You're insulted again. (Act I) Willy's pride is his fatal flaw, making him a tragic hero in the play. Willy concurs with conventional Shakespearian tragedy because of this, though he is not of noble birth as Miller was determined for Willy to be an Everyman. Willy embodies other tragic elements along with this sense of hubris. His moments of anagnorisis are perhaps less obvious as he does not have one moment of intense self awareness, but rather at intervals throughout the play. ...read more. I was!...What a man! There was a man worth talking to. I was right! This persona which Willy adapts during his atypical moments of victory is very compelling for the audience to witness, causing them to empathise with this anti-hero. Another example of this is where Willy believes that all their lives are going to be improved, with Biff going to see Bill Oliver, and Linda has just told him that his sons want to have dinner with him, Willy - Gee Whiz! That's really something. We can see Willy's vacillation from being on an exuberant high, to being down and irritable. This passage gives a very clear and accurate depiction of Willy's mindset as a whole. Throughout the play we see these moments when he lapses into his subconscious; musings that steadily get worse as time goes by. It also gives us indications of the two American Dreams which Willy strives for, though it is impossible for him to achieve both, he can't even achieve one. No matter how much hard work he puts in or how much self-belief he has, he just can't succeed. His failure sends him into a psychosomatic spiral where Willy is left feeling like the only way he can be of worth to, and help his, family is to commit suicide. Willy is a very pitiful character right the way through, yet, despite his mistakes, there is a genuine empathetic affection for Willy Loman, which makes his death even more poignant. (1874 words) ?? ?? ?? ?? Stephanie Moore 27/03/06 Page ...read more. 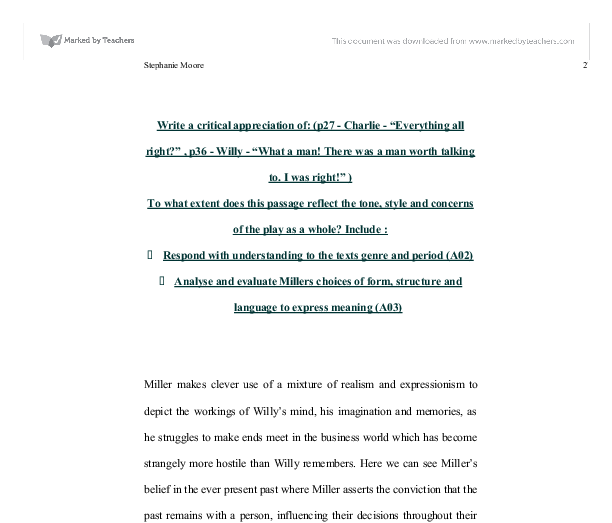 Discuss Miller's Presentation of Self-Deception in Death of a Salesman. This helps the audience understand Willy's state of mind, and can make us feel pity for him. It seems to be heading towards a very tragic end. Symbols play a significant part in the play. It is used to show what is going on in his head. Howard explains that there is no room for him in New York, and then tells Willy that he no longer wants him to represent the company. Now that Willy has no job, he must ask Charley for the money to pay his insurance premium. The first day ends with the bright hope that Willy, Biff and Happy will achieve their goals for the following day. The three of them plan to meet for dinner after they have been to their respective meetings. Unfortunately, Willy is not successful in his meeting with Howard Wagner, his current boss and son of the deceased owner. 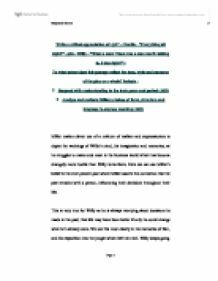 to provide Willy&#39;s victorious reply to all not sufficiently impressed with his own modest advancement. By making his fortune in the business world, Biff would prove that Willy had been right in turning down Ben&#39;s adventurous challenge to head for Alaska. Oliver, however, does not remember him and Viff ends up stealing his fountain pen. Biff admits he a total failure to his father. He says, 'Pop, I'm nothing! I'm nothing Pop!' Willy finds this hard to face up to as he has placed all his hopes in Biff. His life's experiences seem to intermingle and disturb the logical flow of reality views his life as a totality. Conventions of time and place are not relevant for him. Has high ideals-perhaps unattainable ones wants to be loved by all; wants to succeed by terms that do not suit his nature; wants to leave his mark upon the world.